Is it a dip? A pate? Not sure, but three times I’ve found myself bringing spreads made of pumpkin seeds, onion, fresh coriander and pickled jalapeños to parties. Originally I read a version of Sikil Pak, a Mayan Yucateco dish, interpreted in an extravagantly chef-like way (orange zest, really?) on Tasting Table, and have sought since to backtrack to something more simple to learn about what it could be. I’ve never been to Yucatan but imagine I would love eating there. This blogger describes how simple ingredients create such an other-worldly yet earthy, beautiful taste– his version has pumpkin seeds, roasted tomatoes and fresh cilantro (coriander leaf); another recipe suggests charred tomatillos as an alternative to tomatoes (“sikil” means tomato in Mayan, she says) and adds garlic and chives. There are traditional implements and techniques that must make Sikil Pak taste very specific in its cultural context, as this recipe describes– and also mentions that the epic Diana Kennedy suggests toasting your pumpkin seeds AND throwing in some that are raw. These may represent minor variants, and there are plenty more ways to make something similar your own in a home kitchen. Because I based my first effort on Mike Isabella’s Tasting Table recipe, which lacks tomatoes at all, I won’t call what I’ve developed Sikil Pak, though of course I’d love to try that too one day. Instead as I’ve been seeking to simplify, I’ve also enjoyed experimenting with pickled jalapeños with good results. 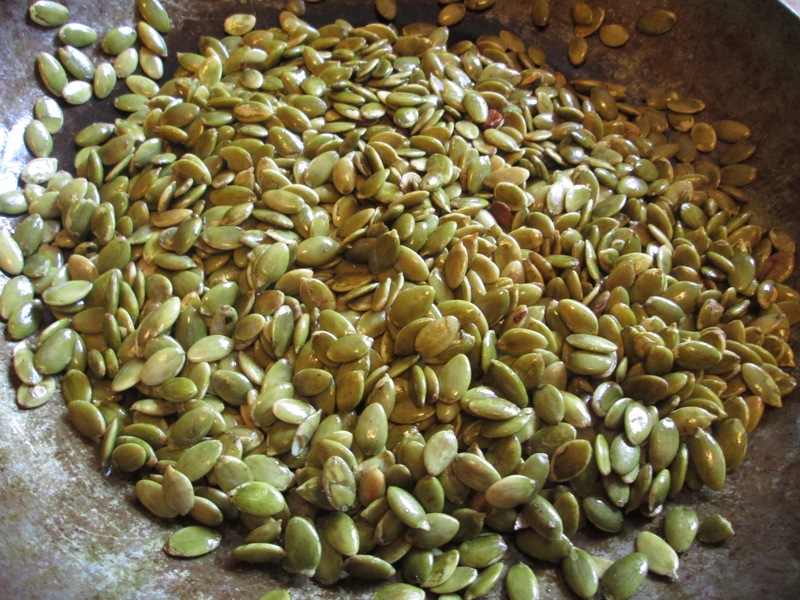 Two cups of pumpkin seeds. Proportions don’t have to be so specific. 1/2 cup (can use much less if desired) vinegar- pickled Jalapeños, store bought or homemade, or fermented Jalapeños. Pay attention to the heat level of your particular batch. If you like, toast your seeds in a hot pan until they are fragrant. I helped them along with a little bit of oil, but not necessary. Soak them in some of the vinegar from your pickled jalapeños. Alternatively, if you are using lacto-fermented chillis — which of course are so healthy and beneficial — reserve some brine for this purpose. If you are Kirsten Shockey, you might like to soak in Curtido brine 🙂 I think scrap Pineapple vinegar would also be fantastic. Many recipes call for lime. I love lime but I also love vinegar (it’s local) and brine (so full of good bacteria); of course neither means you can’t add some lime too. Put the soaked seeds and the jalapeño pickles together with fresh herbs in a food processor, and whizz. Olive Oil helps to emulsify if you like. Instead of soaking, you can also just add the vinegar or brine at the puree stage. This isn’t a fancy recipe requiring an exacting procedure…. Some people aim for a fine gritty texture, others for something more like hummus — I like and have done both. Add extra liquid as required or desired. Serve with crackers or as a dip or especially nice with tortilla chips. Would be great in a taco. Last night this dip became part of a whole multi-cultural buffet, and I think it worked as a rather nice salsa on so many foods that are part of participatory arrays like this. Trust me, it’s wonderful. A PS, regarding the jalapeños, we’d actually been in Brum last Saturday, and bought 2 kilo of jalapeños for £2, true bargains being a perk of busy city markets at the closing of a week. First thing I did was begin to ferment a bunch, add others to a kimchi, and do a simple vinegar pickle with still more. I used my apple scrap vinegar which is lovely for a short preservation or souring but so inclined to developing Kahm Yeast on the top that I can’t rely on this batch for any long term uses. Categories Lacto-Fermentation, Preserving, What to Make? This sounds fantastic – and now I want to ferment some jalapenos! Fermented jalapeños are useful all around! It wasn’t long ago that pickled jalapēnos began appearing in British markets. Back in Oxford, I used to grow them on my allotment and pickle my own. I’ve since become lazy and just buy jars of them now that they have become available. I really love the idea of this pate/dip/spread, but I would definitely add some roast tomatoes. May also pickle a few jalapēnos. Thinking back, they were much better than store-bought. I also like those lazy jars, they have a je ne sais quoi 🙂 And yes to roasted, charred tomatoes, must try that, although I like the slightly gritty texture…..
I’m going to give this one a try. Going to try this – maybe with some sun-dried tomatoes thrown in – sounds really good.